Set up and configure your Sonos along with favorite streams, pairs and group players using the Sonos Controller app on your iOS or Android device. Harmony learns from the Sonos setup configuration and will reflect those settings within your Harmony account. Follow the steps below to connect Harmony and Sonos. 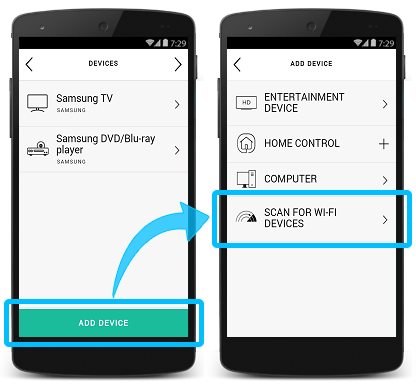 Select SCAN FOR WI‑FI DEVICES and Harmony will search for any connected Sonos devices on your home Wi‑Fi network. Harmony IR remotes are only able to control Sonos Beam, PLAYBAR, and PLAYBASE. Harmony will scan your home Wi‑Fi network for Sonos speakers. Harmony will automatically add all Sonos speakers that are on your Wi-Fi network. Select the Listen to Sonos Activity type and select Next and follow the prompts. Launch your Listen to Sonos Activity and select the Favorites icon to view all your saved Sonos stations. It's that simple. Use your phone volume keys to change levels on your Sonos when you're in the Harmony app. Access Sonos in device mode to view and update its group composition. You can extend audio to new Sonos speakers while your Listen to Sonos Activity is running. Harmony automatically imports your Sonos favorites and displays them under the favorites section on your Harmony remote. Commands specific to your Listen to Sonos Activity are also displayed for which you can add, remove or rename them. You can view common Sonos commands on your phone or tablet screen. You can add, remove or rearrange these commands. Harmony allows you to import your Sonos favorite stations and start playing them automatically when you start your Listen to Sonos music Activity. You can create unique Activities such as a "Good Morning" that turns on your lights, opens your blinds, starts the coffee maker and begins playing a specific Sonos station such as the news channel. You can also create a more generic Listen to Sonos Activity that simply lists your favorite stations allowing you to pick one based on your mood. To create a new Sonos Activity, select ADD ACTIVITY. You may have multiple Activities that launch different stations. To edit the starting station for an existing Sonos Activity, first select that Activity, then click STARTING CHANNEL. Harmony will ask you if you'd like to select a Sonos station to play when this Activity first launches. Skipping this step will begin playing the last radio station, just as the Sonos app does. Sonos SUB may be included as part of a system and will work with the speaker it has been joined with; however Harmony cannot control it directly. 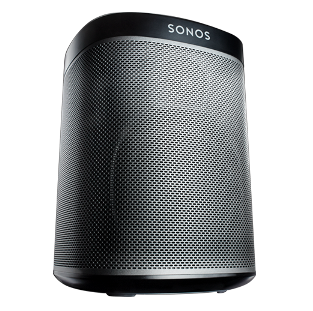 Sonos BRIDGE (BR100) may be used to connect your wireless speaker system; however there are no functions for Harmony to control. What if I have more than one Sonos player? Harmony will scan your home network and allow you to add all of your Sonos players or PLAYBARs. Sonos supports up to 32 components. You may create different Activities to control each one individually, or group them from the Sonos app and control them together using Harmony. How do I sync my Sonos favorites with Harmony? Harmony will automatically sync your Sonos favorites the first time the Favorites screen is viewed from within the Harmony app or Harmony Ultimate remote. If changes are made within the Sonos app, select the "Refresh Favorites" button in Harmony App to sync those changes. If using the Harmony Ultimate remote, select Menu from within the Favorites screen, select Edit, press the (+) symbol, select Rescan and then Cancel to exit out of the menu. It is not possible to create or edit Sonos favorites from within Harmony. Sonos Beam connects to your TV’s HDMI-ARC port. Most TVs have two to four HDMI ports, one of which is labelled ARC, which stands for Audio Return Channel. The HDMI-ARC port syncs audio and picture. If you’re unsure if your TV has an HDMI-ARC port, consult your TV specs with the manufacturer. If your TV is older than 5 years, or otherwise doesn't have an HDMI ARC port, you can use the included optical audio adapter to connect Sonos Beam to the optical port on your TV. Please note that Amazon Alexa TV voice commands will not work when connected via optical adapter. For compatible TVs, Sonos Beam introduces commands such as “Turn on the TV” and “Turn off the TV”. When Sonos Beam is connected to your TV’s HDMI-ARC input and your TV's CEC features are turned on, Alexa may prioritize Sonos voice commands over Harmony, which will prevent your Activities from launching. To resolve this, you may edit the device name of your TV within the Alexa app to anything but TV or its current default name. To do so, launch the Alexa app and navigate to Menu > Smart Home > Devices, from there you will be able to edit your TV's name. Ensure your Sonos are powered on and connected to your home network. Harmony Hub must be connected to the same Wi‑Fi network as your Sonos players. From Harmony setup, add a player such as manufacturer: Sonos and model number: PLAY:1 to begin discovery of your connected devices. All commands, including play, pause and interacting with Sonos favorites are controlled using a Wi‑Fi connection from Harmony Hub to Sonos. Please ensure Sonos is connected to the same home network as your Harmony hub. With the exception of Sonos Beam, PLAYBAR, and PLAYBASE, Sonos devices do not accept infrared (IR) commands, and only Harmony hub‑based products are able to control them.